If you're new to playing online poker, you'd be forgiven for thinking that there was only one variety of poker – Texas Hold'em. Texas Hold'em poker is by far and away the most popular variant of poker there is, particularly when it comes to both online poker playing and television poker tournaments. If you happen to catch coverage of a poker tournament on TV, the chances are that the game will be Texas Hold'em. If you've some experience with Texas Hold'em poker, don't be afraid to skip past sections that you're already familiar with using the links above. Once you're comfortable with the gameplay rules of Texas Hold'em, don't forget to read my reviews of the best poker rooms at which to play. 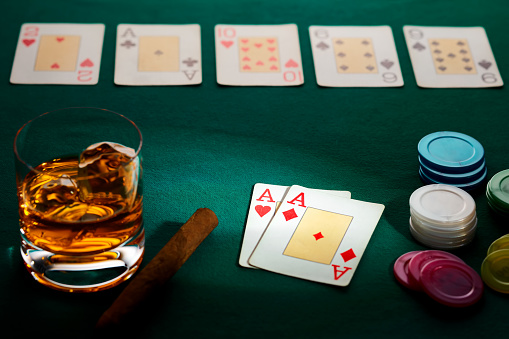 Legend has it that Texas Hold'em originated in Texas, naturally, although there's no actual proof. It was introduced to Las Vegas and began to grow in popularity in the 1970s, but it was the rise of internet poker that led to the rise in the popularity of Texas Hold'em poker. Of all versions of poker, Texas Hold'em poker is the one where skill and ability far exceeds the “luck” factor inherent in any card game. Good players began to make heaps of cash by playing Texas Hold'em poker online, and when a previously unheralded accountant named Chris Moneymaker won the 2003 World Series of poker after entering a satellite tournament for a mere $39, suddenly everybody wanted their own little piece of Texas Hold'em poker action. Texas Hold'em poker is a “community cards” game like its slightly less popular cousin, Omaha poker. Each player in the deal is dealt two cards, known as their “pocket” or “hole” cards. These cards are keep secret. A round of betting follows, then the dealer deals three cards face up, which are known as the “flop”. There is another round of betting, after which the dealer deals a further card face up, known as the “turn”. After further betting the dealer deals the final community card, called the “river”. One more round of betting then any players remaining in the deal reveal their pocket cards – the winner is the player who can make the best poker hand of five cards from the seven that are available, namely his pocket cards and the community cards. Please note, not all hands of Texas Hold'em poker make it as far as the river – some hands don't even get as far as the flop if all but one of the players fold their cards. Out of these three varieties, No-Limit Texas Hold'em poker is the most popular. Usually, there are between two and ten players in a game of Texas Hold'em poker. The most popular table number are two (known as “Heads Up”), six, nine or ten. Before the first hand, a method is used to determine the first dealer. Most poker chip sets come with a large button marked “dealer” - this is passed to the left at the end of each deal, so each player deals in turn. In casino events the casino appoints a non-playing dealer, but the dealer button is still passed around, as the position of the current dealer is very important. Before the deal commences, the two players to the dealer's left are forced to make a small bet – the amount is agreed in advance, and may rise in value as the deal progresses. The player immediately to the dealer's left is called the “Small Blind” and makes the small bet. The player immediately to the Small Blind's left has to make a bet that is double the size of the small blind's bet, as is known as the “Big Blind”. These bets ensure that each hand in Texas Hold'em poker there is something “in the pot” to be won. These players are known as blinds as they have to make bets without seeing their cards. In our example deal above, Alex1974 is the dealer, so BusyBeth post the Small Blind (in this example, $1), and C*H*I*C the Big Blind ($2). The dealer (Alex1974) now deals two cards, starting with the Small Blind, to each player. These are known as “pocket” or “hole” cards and must not be seen by the other players. Once everyone has seen their cards, the betting begins. Betting commences after the deal with the player to the left of the Big Blind, as the Small Blind and the Big Blind have already made their bets. Betting continues until all the players have either folded or matched the current highest bet. Let's work through a quick round of betting. In our example, once the deal has been made, Dangerboy is the first to act, as he is to the left of the Small Blind. He doesn't like his cards, so folds. EdPokerK (who, in this example, is the main player we are following), has drawn K♣Q♣, and decides to play. He could call, as the current highest bet is the $2 posted by the Big Blind, but instead (as K♣Q♣ as good pocket cards) he decides to raise, to $6. F1ON4, GazMan and Harry99 all decide fold. IceQween calls - matching the current top bet of $6. JuicyJay folds, and Alex1974 also calls at $6. BusyBeth already has $1 in the pot as the Small Blind, but decides to fold. C*H*I*C calls as well - as he already has $2 in the pot as the Big Blind, he has to add $4 to it to make it up to $6. As DangerBoy had folded, and EdPokerK was the last player to make a bet, the betting round is over. The chips ($25) are collected in to form the pot. In our deal, Alex1974 would now deal three cards face up to form the “flop”. He deals J♥J♠A♣. Once the flop has been dealt, the first player to act is the player closest to the dealer's left who is still in the deal. In our example, this would be C*H*I*C. As he already has money in the pot, he can check and stay in the deal, which he does. EdPokerK makes a bet, of $20. IceQween calls $20, but it's getting too rich for Alex1974, who folds. C*H*I*C also calls, $20. The play is back to EdPokerK, but as he was the last to make a bet, the betting is over. The chips are collected up and added to the pot, which now stands at $85. Alex1974 deals the turn, the A♠. C*H*I*C is first to act again, and check. EdPokerK makes another bet, this time $60. IceQween decides to raise, raising to $120. This is too much for C*H*I*C, who folds. The decision is now with EdPokerK, as his $60 was raised. He can either fold, call or re-raise. He decides to call, bringing his bet up to IceQween's $120. The chips are collected in again, and the pot now stands at $325. Andrew then deals the river - another ace! This time, the A♦. As often happens in Texas Hold'em poker, when all the community cards have been dealt, only two players remain. As C*H*I*C has now folded, the first player to act is EdPokerK, who bets again, this time $300. IceQween immediately re-raises up to $600. EdPokerK can again now fold (in which case IceQween does not have to show her cards), call (in which case we enter a showdown) or re-raise (in which came the decision of what to do next falls to IceQween). EdPokerK decides to call, throwing another $300 into the pot, which now stands at $1,525. The showdown. IceQween had the other ace! This means her best hand from the seven available would be four aces and a jack. This beats EdPokerK, as the best he can manage is a full house, three aces and a pair of jacks, using all five community cards and neither of his two pocket cards. IceQween wins the pot! All chips and given to IceQween, all cards and passed in and the dealer button is passed one space to the left, to Busy Beth, and the next deal begins - and that's how you play Texas Hold'em poker. Why not head to the tables now? Check my poker room reviews to see which is the room that will suit you best. The aim in Texas Hold'em poker – as in any form of poker – is to obtain the best hand. Don't forget that your hand can be made from any five cards of the seven available; your pocket cards and the five community cards (you can even use all five community cards if necessary). A run of five consecutive cards of the same suit. If two players both have straight flushes, the player with the highest card wins. The suits themselves are not important. The best hand of all is known a s a Royal Flush, which is AKQJT of the same suit. Four cards of the same value. You can only get a tie with a four of a kind if you are playing with “wild” cards (cards that can be substituted for any other card), in which case the player with the highest spare card, or “kicker” as it is known, wins. A set (three of a kind) and a pair. If two or more players have a full house then the player with the highest set wins. If this is a tie (if you're playing with wildcards) then the highest pair wins. Five cards of the same suit, but not a straight flush. In the case of two or more players having a flush, the player with the highest card wins. If this is still a tie, then the player with the next highest cards wins, and so on. If all five cards are the same between two players with a flush, then the pot is shared between them. Five cards of different suits but in sequence. In case of two or more players having a straight, then the player with the highest card wins. If this is a tie, then the pot is shared. Three cards of the same value. When two or more players have sets, the highest set wins. In case of a tie (when playing with wildcards), the highest card not part of the set wins, and if still a tie, the last card. If still a tie, then the pot is shared. A hand with two pairs. The highest value pair is the tie-breaker, and if still a tie, the second highest pair (i.e. AAQQ6 beats AAJJK). If still a tie, the “kicker” breaks it and if still a tie, the pot is shared. A hand with a single pair. The same tie-break principles as applied above apply here. If a hand does not even have a pair, then it is ranked by the highest card. High card hands can still occasionally win pots, but infrequently. There you have it – all you need to know about playing Texas Hold'em poker! Whole volumes have been written on Texas Hold'em poker strategies. If you're a beginner, don't attempt to eat up these works and expect to be a good player straight-away. Get used to playing first before you jump into the technical aspects of the game. Here, however, as some basic ideas about how to go about playing. Texas Hold'em poker is a game of incomplete information. You don't know your opponent's pocket cards, unlike say, chess, where your opponent's position is right there in front of you. In Texas Hold'em poker, the more information you have about a hand, the more likely you are to win. The amount of information available to you depends on your position at the table. The best position is known as “late”, which is either the dealer, and one place to the dealer's right. The worst positions are the blinds, or “early”, which is when there are two, three or four players ahead of you. If you are the last to act following the flop, turn or river, then you are in a strong position, then you can dictate the hand. If you are first to act then you are in a weak position. Remember where you are in the deal, and tailor your play accordingly. Top pairs (AA, KK, QQ) – raise and re-raise in ALL positions. Middle pairs (JJ, TT) – raise when late or blinds, call or fold if raised in all other positions. Bottom pairs (99 to 22) – call or fold if raised in all positions. Suited high cards (AK, AQ, AJ, AQ) – raise in ALL positions if no one else has raised. If someone has raised, the call. If someone has re-raised then fold. Off-suit high cards (AK, AQ) – raise in ALL positions EXCEPT early – there you should call and fold if raised. If not early, raise if no-one has raised. If someone else has raised, call. If someone has re-raised then fold. Suited medium cards (AT, KJ, KT, QT, QJ, JT) – call EXCEPT early if at least two players before you have called, else fold. If early, call but fold if raised. Suited connectors (T9, 98, 87, 76, 65) – If blinds or early, fold. If middle or late call if two players before you have called, else fold. Fold if raised. Aces (A9 through to A2) – If late, call if two players before you have called. Fold if raised. All other positions, fold. Many people think that Texas Hold'em poker is a game of constant bluffing, but that's not the case, especially when playing on line. If you're a new Texas Hold'em poker player, then it perhaps best to ignore bluffing until you've gained some experience at the tables. Once you're confident enough to bluff, it's okay to make the odd bluff when it suits. If you think your bluff's been called then don't waste chips in trying to conceal it until the bitter end. This is something that beginners seem to have trouble with, and it shouldn't be. The idea of Texas Hold'em poker is to get chips into the pot, and you can only do that by getting a lot of your own in there first and getting players to do the same. Of course you're risking your own chips in doing this, but if you're playing the game properly, the risk is minimized. If you make a bet before the flop, it should always be around three times the size of the big blind – no matter how strong your hand is if you're playing a starting hand that can be played in your current position. If you make a bet after the flop, then it should always be around two-thirds to three-quarters of the current size of the pot. You will learn more about bet sizes the more you play. This concludes my section on the basics of Texas Hold'em poker. I hope it will help you to start your online poker career profitably, both in terms of cash and enjoyment!